Once you’ve had your fill of artificial frights this Halloween season, explore the rich US colonial history that makes Connecticut one of the nation’s most haunted destinations. Bewitched bars and restaurants, horrifying hotels, macabre old mansions, creepy cemeteries, and hair-raising hospitals abound in the Nutmeg State. Each of these spooky spots affords you, the presumably living, to rub elbows with the decidedly dead. Visit each one, and see if you can’t conjure a chat with the ghosts and ghouls that haunt these damned locales -- IF YOU DARE. Open for business since 1754, Curtis House is the state’s oldest inn. The quaint 18th-century hotel doesn’t advertise itself as being ghost-friendly, but online reviews detail accounts of paranormal experiences that enlivened many an overnight stay. One visitor had a television remote go missing, and later found it by the TV, although no one had moved it. 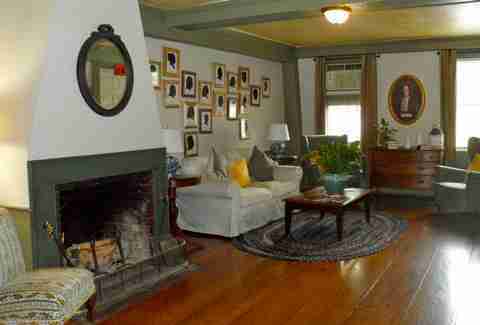 A self-described “paranormal investigator,” who says she didn’t know the place was haunted, reported that her room was packed with spirits. Celebrity chef Gordon Ramsay spent time at the inn in 2014 for his show Hotel Hell and encountered a ghost named Betty who locked him inside his room. And former employees are believed to be among the dead who like to haunt the place. 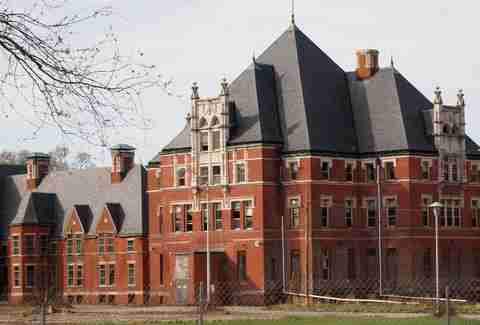 Good luck sneaking into this vacant state mental asylum that closed in 1996 due to decades of grotesque abuses. A private developer bought the castle-like brick building last summer, and security guards are protecting the site from potential trespassers. Visitors can still drive up pretty close to the real-life House of Horrors to photograph the scene of human torture. Patients were either killed, holed up in solitary confinement, or even sterilized if deemed too mentally unfit to procreate. Adding to the tragic history: The institution was built on top a former Native American village. SYFY network’s reality show Ghost Hunters toured the empty facility in 2010 and made an episode about the strange voices, eerie lights, and oddly moving shadows found inside. Amateur ghoul fans have also managed to get into the building, and have shared footage on YouTube featuring unexplainable sights and sounds. Legend has it, this New York Times-reviewed “modern creative” restaurant was once the grisly murder scene of a love triangle gone wrong. The place used to be The Pettibone Tavern, which opened during the Revolutionary War and became a popular meeting place for Colonial Era men who swapped news about battles over drinks. The tavern’s 18th-century owner, John Pettibone, decapitated his wife Abigail after he supposedly caught her in the arms of another lover. Abigail has allegedly been haunting the place ever since. The book Haunted Connecticut calls her Simsbury’s “most famous ghost,” and details her antics, which include hanging inside the ladies bathroom and rearranging furniture. Watch and decide if it’s really Abigail fulfilling a 13-year-old girl’s birthday request to spooookily activate a paper towel machine in this video. You can honor the veterans who died fighting in the Revolutionary War and in the War of 1812 at this historic gravesite. 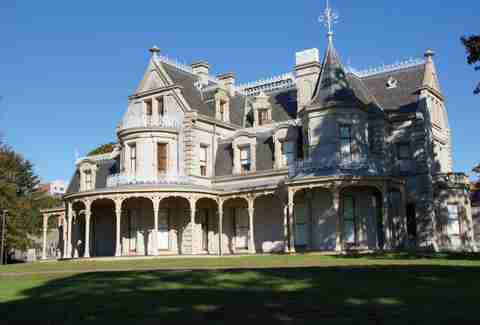 And yes, the place is also one of Connecticut's most popular haunted burial grounds. Online reviews are pretty creepy. One visitor wrote: “you will deffinatley (sic) find a presence with you. happy hunting. 10/10 place to go with actual results!! !” Another writer shared a chilling post about a late-night visit to the cemetery that was punctuated by mysterious music, and almost didn’t end. There are also reports of a spirit man walking around with a lantern, and the rare ghost dog sighting. The resident ghosts at this Italian restaurant may swing by your table in between courses. 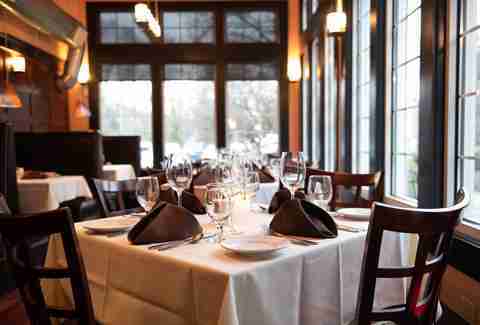 Twisted Vine has an impressive wine list, and off-menu items that will slake your appetite for the supernatural. The eatery is housed in a defunct 19th-century national bank that’s supposedly a hotspot for the spirit world. Employees reportedly hear strange sounds, like mysterious footsteps and slamming doors. Amateur ghost hunters have detailed how their Ghostbusters-like equipment has picked up signs of dead visitors over the years. Naturally, there’s no clear evidence of where the ghosts are coming from. Some believe it’s the bank’s long dead founder, Edward N. Shelton, while others surmised that the hauntings are tied to a 1955 flood that damaged a nearby cemetery. 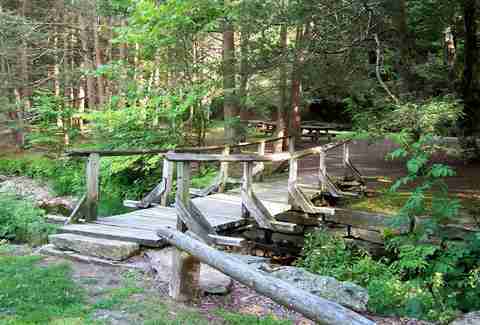 The northeastern part of the state boasts a real-life patch of haunted woods, which once housed a bustling Revolutionary War village. Visitors to Ragged Hills have not only seen and heard the ghoulish remnants of human ghosts, but signs of dead animal spirits, too. Formerly named Bara-Hack, the area was the home to colonial settlers who set up a wheat processing business during the late 1700s. The thriving factory town of sorts stayed afloat into the next century, until people moved onto greener pastures. Residents of Bara-Hack, Welsh for “baking of bread”, left behind a cemetery and building foundations made out of stone. It’s a popular destination for ghost-chasers who’ve posted a fair amount of creepy videos onto YouTube. Warning: Bara-Hack sits on private property, so enter at your own risk. The easiest way to find a ghost is to walk around an abandoned cemetery, and this defunct gravesite for local churchgoers doesn’t disappoint. The Connecticut Post deemed it one of the state’s most haunted places. The 18th-century burial grounds’ most famous spirit is The Green Lady, aka Elisabeth Palmiter. Elisabeth supposedly died while searching for her husband during a terrible storm, and somehow drowned in a swamp. She is now believed to appear as a green floating mist. At least one version of the tale says Elisabeth died wearing a green dress. The Connecticut Post deemed the cemetery one of the state’s most haunted places. 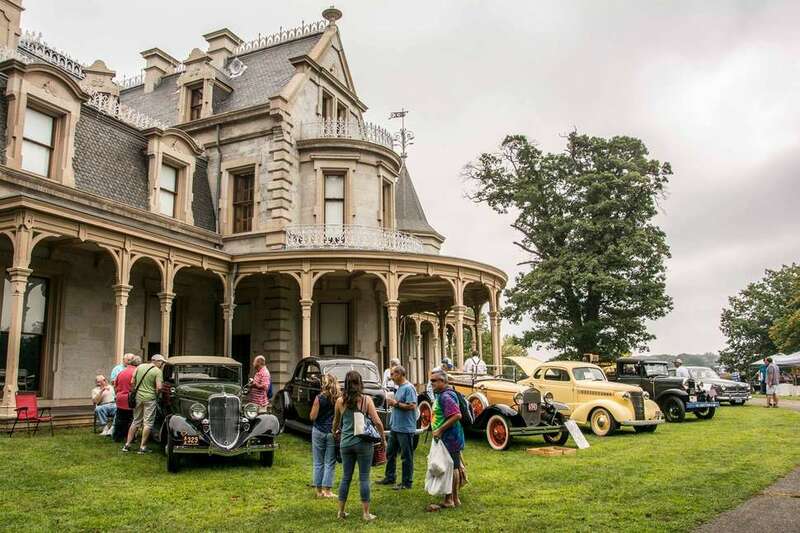 Named after a railroad tycoon (Lockwood) who built the opulent estate, and the New York financer (Mathews) who later bought it, visitors can check out this lavish home to see how the rich lived back in the day. Also, you can maybe meet a “ghost” or two. Museum workers milk the big spooky space for all that it’s worth, hosting ghost tours where still-breathing humans dress up as spirit guides and surprise the guests. This Halloween season, visitors are invited to come to the mansion to learn about ghosts of the Civil War era. Are there actual real ghosts on site? A 1869 news report details the grisly death of a man who suffocated in a “bed of mortar.” It’s unclear how the victim ended up such a precarious position. The inn’s lovely website says the bucolic property has undergone a million-dollar renovation, is a great place for weddings and is also the perfect destination for travelers who need to relax and chill. What it doesn’t give you are details about the Native American woman’s ghost who has attracted thrill-seekers for years. Internet sleuths says she likes to hang around the kitchen and in the dining room. Other sightings include a possible separate woman who appears in guest rooms, only to disappear when visitors report her to the insouciant staff. 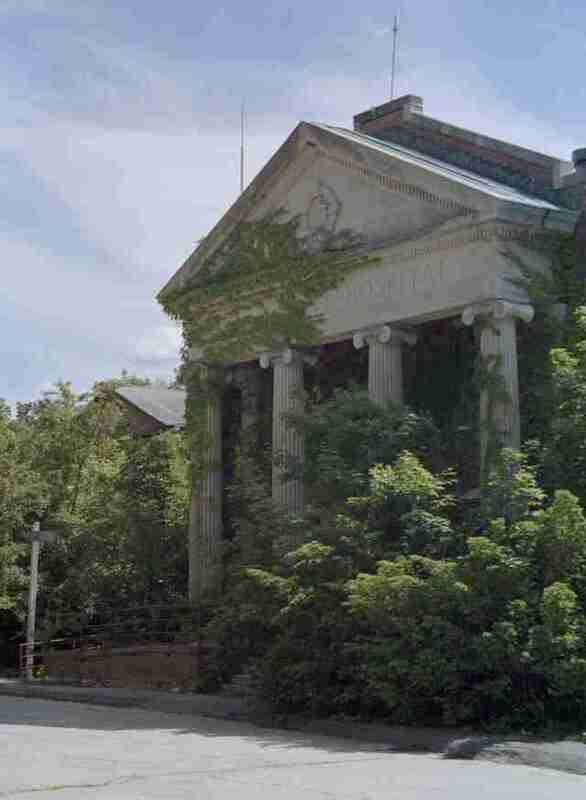 The University of Connecticut acquired this defunct institution after it shuttered in 1993. Long ago known as the "Connecticut School for the Imbeciles," the unfortunately monikered mental health hospital housed hundreds of patients throughout the 20th century. The buildings are still standing thanks to the National Register of Historic Places which added the property to its list in 1987. Is it haunted? A UConn spokesman told the Hartford Courant that the university was unaware of any ghost sightings. But Damned Connecticut says there have been ghostly sightings, sounds, and “spirit mist.” It looks the part, at least: The spot attracts scare-seekers and filmmakers alike.